I found myself needing to revisit a potential leak from the water pump and found the instructions I had written several years ago when I replaced my timing belt and water pump in my Sebring. These instructions were originally posted on the Sebring Club web site at the following address. I’ll be updating them as I do some more work with, hopefully, some better photos. I was motivated to do this work because of a bearing growling sound emanating from the engine. It would grind at low rpms when the engine was cold and then only be noticeable when you initially put on the gas (very quick growling sound). I figured it was the water pump bearing, the tensioner pulley bearing or the idler pulley bearing. At 104,000 miles, I figured it wouldn’t hurt to replace some stuff, anyway. There were two main reasons that I did this work myself. One, I am a do-it-yourselfer that doesn’t shy away from most any task. Two, I’m cheap! Another motivation was I got several quotes for replacing the timing belt and water pump. The lowest I got was about $600 (and I think it would have been higher). The highest was from the dealer…$1100! All I heard from everyone was how hard this was, so I was thinking I would have to put out some bucks to get ‘er done, but luckily, I reconsidered. 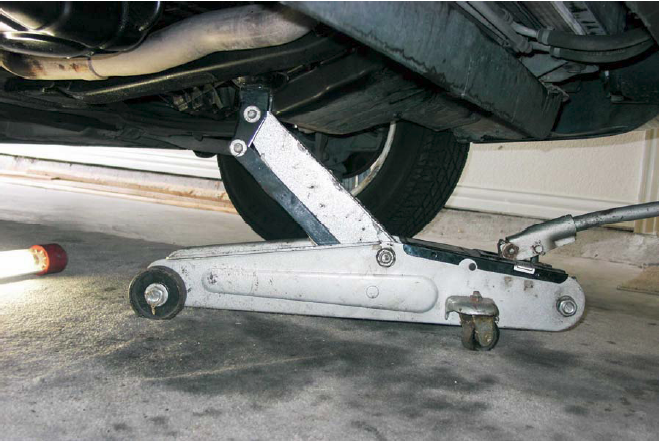 To start this job, jack up the car and support it with a jack stand. I always use the jack and a jack stand for safety. Remove the right wheel so you can get to everything. You probably notice the smaller jack that is under the engine. This is used for supporting the engine when you remove the right engine mount. Removing the right engine mount is one of the first things you have to do. I didn’t get a picture of this, but you need to remove the lower plastic splash shield that covers the a/c compressor, power steering pump, etc. It is held in place with 2 plastic rivets and 3 plastic barbed push fasteners. I was able to reuse all the fasteners when I went to reinstall it. 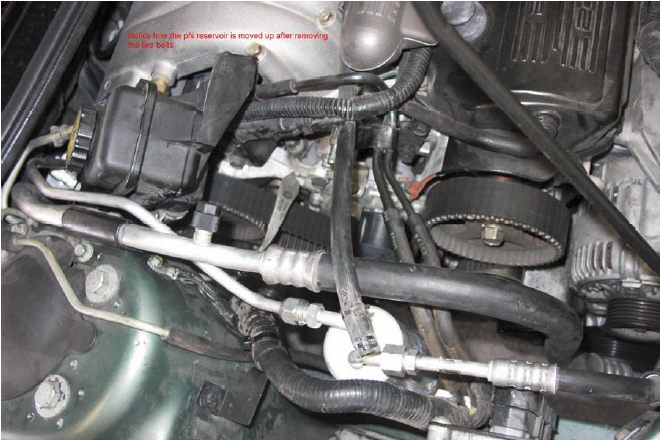 Take off the power steering pump belt and the a/c-alternator belt. 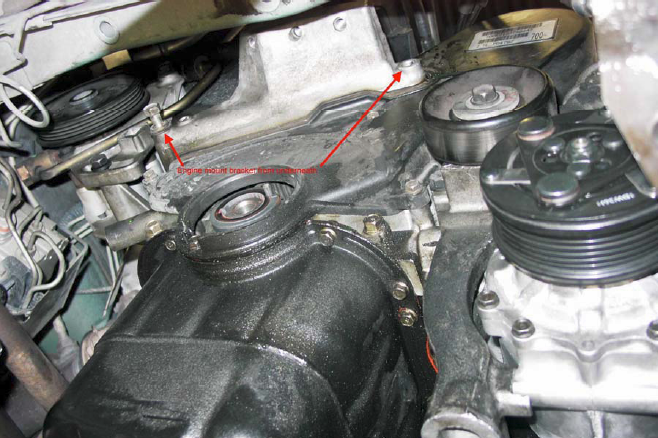 To remove the p/s belt, loosen the bolts and it should come off easily. Notice that the p/s pump has a ½” square socket on it. You can put a ½” ratchet or breaker bar in the socket to hold tension when you reinstall the belt. 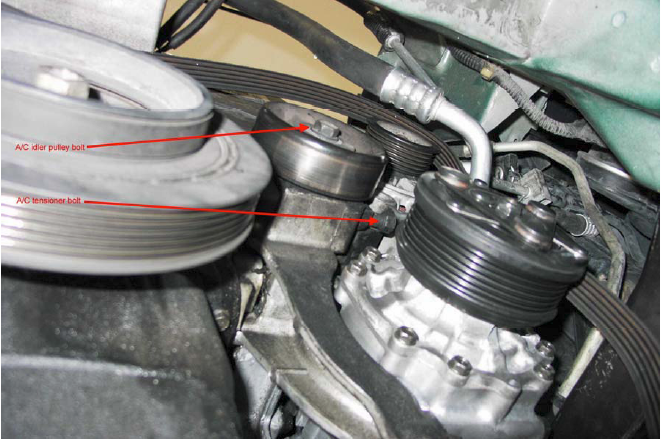 The a/c belt is removed by loosening the idler pulley bolt slightly and then loosening the tensioning bolt. It’s very easy to reinstall. 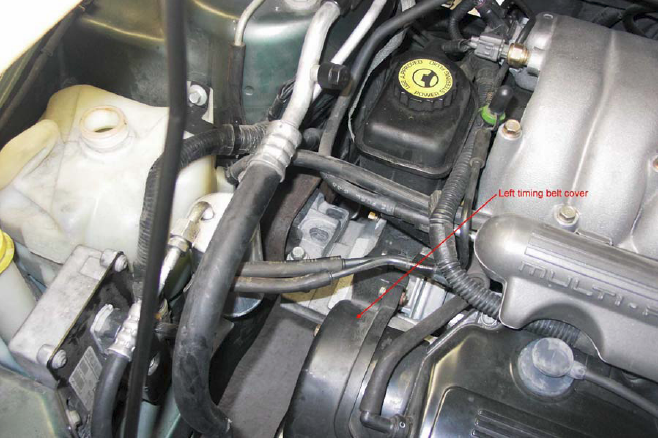 Remove the radiator overflow tank by taking out the two bolts and disconnecting the hose. Unbolt the a/c drier (one 10mm bolt) so you can move it out of the way. I also removed the two bolts that hold the power steering reservoir so it could be moved out of the way of the right timing belt cover. 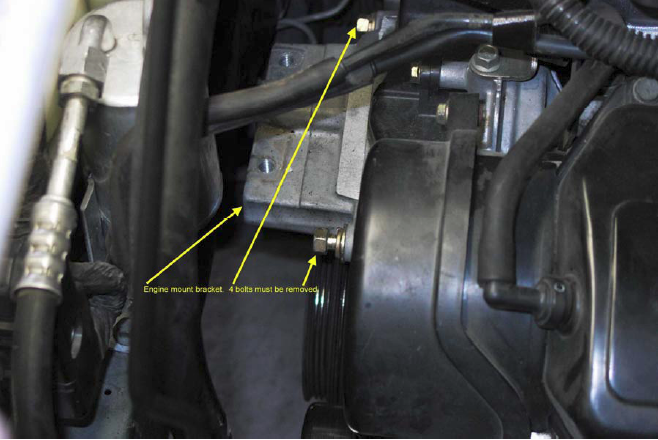 There are 3 bolts that need to be removed to separate the engine mount. You’ll be able to tell you have the engine supported correctly as the bolts will come out easily. Here’s a photo showing the p/s reservoir swung out of the way. Next, remove the two bolts that hold the engine mount to the frame. This is done from underneath the car. Now you should be able to remove the engine mount from the top. 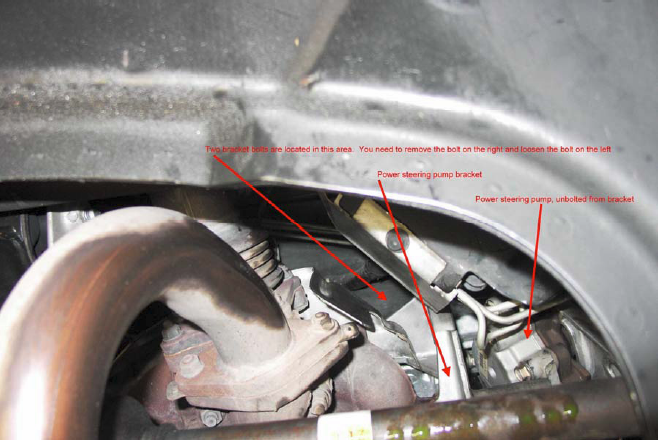 Remove the 4 bolts that attach the engine mounting block to the engine. 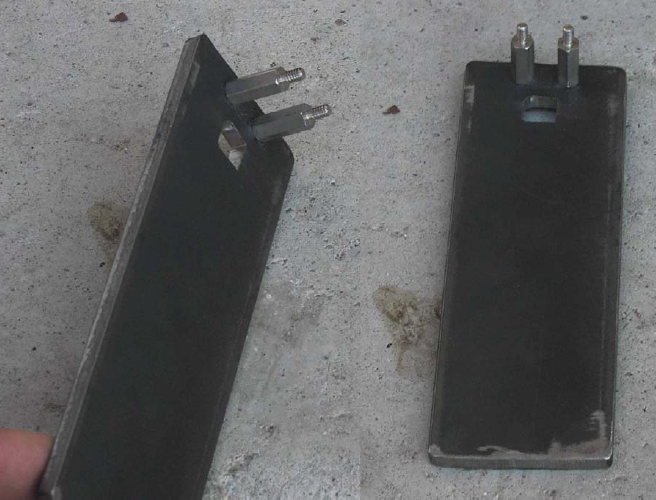 The engine mounting block should be easily removed. More engine mounting block bolts, shown from below. Now its time to remove the flywheel pulley. There is a 22mm bolt that holds it on…real tightly! 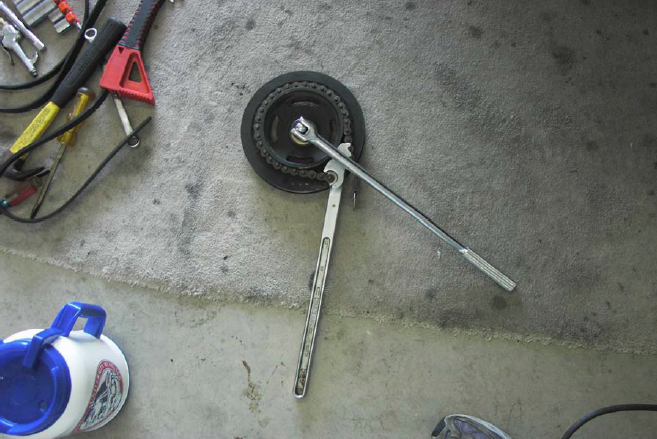 I had to use a chain wrench to hold the pulley while using a ½” breaker bar. I’m sure there is a tool for holding the flywheel pulley, but I didn’t have it. I tried using one of those rubber strap wrenches, but it just wouldn’t hold tightly enough. Here’s a photo of the flywheel pulley. I actually put the pulley back on temporarily to take this photo. It slips easily on and off the end of the crankshaft. Just be sure to align the pin. Here’s the wrench arrangement I used. I had to be very careful not to mar the pulley with the chain wrench. Man, was it on tight! Now on to removing the timing belt covers. There are three of them. You need to remove the upper left first (near the front of the vehicle), then the lower and then the upper right (near the firewall). Here’s the left cover. Don’t have a good picture of the right cover, but it’s underneath the power steering fluid reservoir. After you get the timing covers removed, take the time to line up all the timing marks. The crankshaft has a mark that lines up with a mark on the engine block. The cam pulleys have timing marks on them that line up with “V” notches. Here’s the crankshaft and its timing marks. Here’s a picture (not very good) of the timing marks on the left cam. Mine had a little bit of white paint on the mark on the cam pulley. The valve cover has a notch in it that should line up with the mark on the cam pulley. There’s also one on the right cam, but I failed to get a good picture of it. Picture, if you can, a similar set of marks under the power steering reservoir. 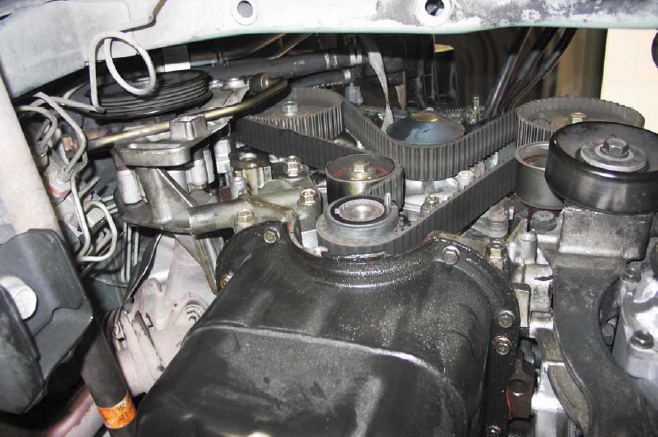 The hardest part (and I do mean the hardest) had little to do with the timing belt. It had to do with the power steering pump bracket. 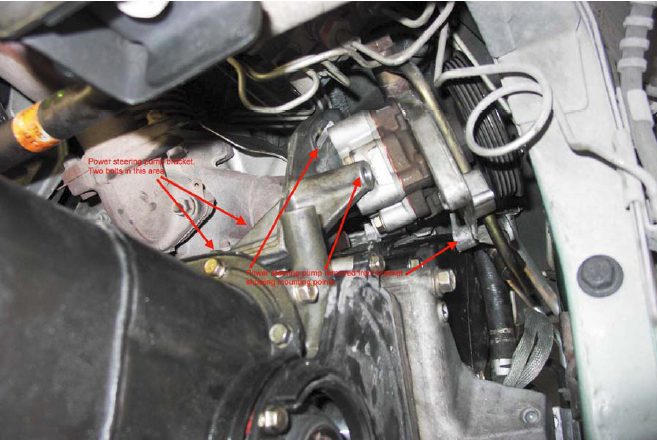 In order to remove the right timing belt cover (nearest the firewall) you need to unbolt the power steering pump from its bracket (3 bolts) and take 3 of the 4 bolts out of the power steering pump bracket, and swing it out of the way to provide clearance for removing the cover. Sounds easy, right? This was the most difficult task for me since the top two bolts are in a very tight clearance area. Here are a couple of photos that show what you are up against. It was hard just to get some photos that show much. Important!!! There are two bolts on the top of the p/s pump bracket. You only need to completely remove 1 (towards the passenger side) and loosen the other. This will allow enough movement of the bracket to swing it out of the way of the right timing belt cover. Unfortunately, you can’t even see the tops of the bolts from this picture. I’d have to have a fiber optic camera to show you the heads of the bolts. Use your imagination! By the way, I’m about 6’-1” 220 lbs and was able to put my hands up in that area to get to the bolts, so someone with smaller hands will likely have an easier time. Here’s another one showing where the lower two bolts are on the p/s pump bracket and the 3 bolts that hold the p/s pump to the bracket. 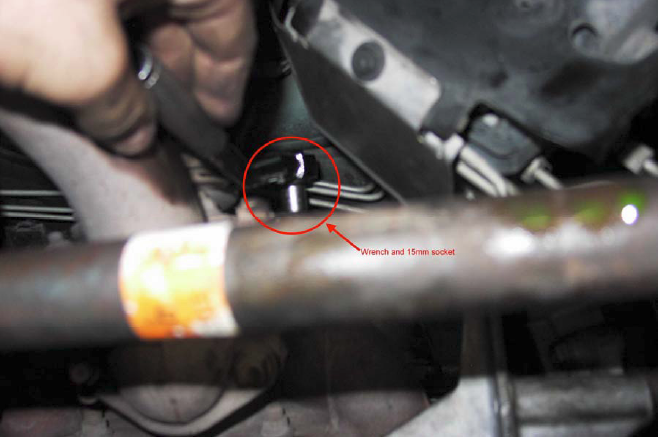 And here’s one showing my hand and the wrench working on one of the hard-to-reach bolts. It’s one of those situations where you have to work the bolt a little at a time and, if your hand will fit, finish it the rest of the way with your fingertips. Sorry for the focusing problem. It’s made out of a piece of 1/8” x 2” steel bar (could have been 1/8” x 1-1/2”) and two #6 hex standoffs. I measured the distance between the holes on the tensioner pulley and punched and drilled the holes for the screws to hold the standoffs. After determining that the original length of the bar caused some interference problems, I cut out a square 3/8” hole so I could put a socket wrench on it. I could have cut it off to be 1” long, but I was lazy and didn’t want to get the hacksaw out again! This tool is used to preload the tensioner pulley with 3.3 ft-lbs of torque prior to releasing the hydraulic tensioner. Took me a little while to figure out what they were trying to accomplish in the shop manual, but after careful studying, I finally got it. There are two holes in the tensioner pulley that accept the #6 male ends of the studs. 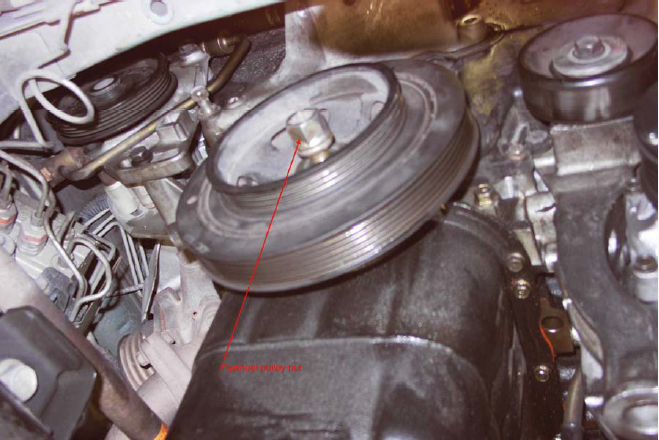 Basically, you loosen the tensioner pulley bolt and put 3.3 ft-lbs of CCW (counter-clockwise) torque against the timing belt and then tighten the pulley bolt. This is all done with the hydraulic tensioner in a compressed mode. 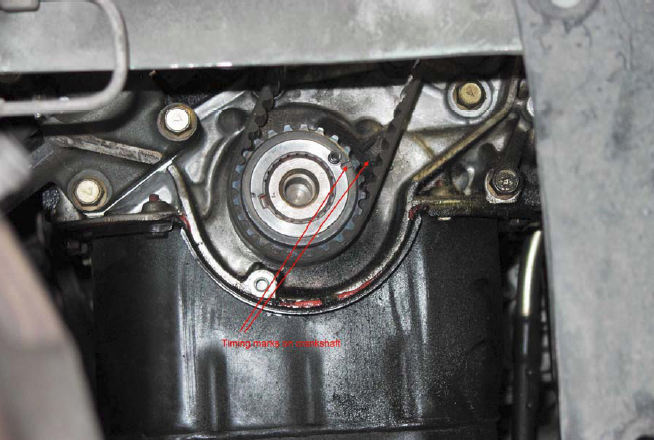 To compress the tensioner, remove it by taking out the two bolts. The, using your handy vise on your workbench (everyone has one, right?) compress the tensioner. I suppose you might be able to use a C-clamp to compress it, but I’ve never tried this. The hydraulic tensioner is held compressed with a pin (small allen wrench or cotter pin). 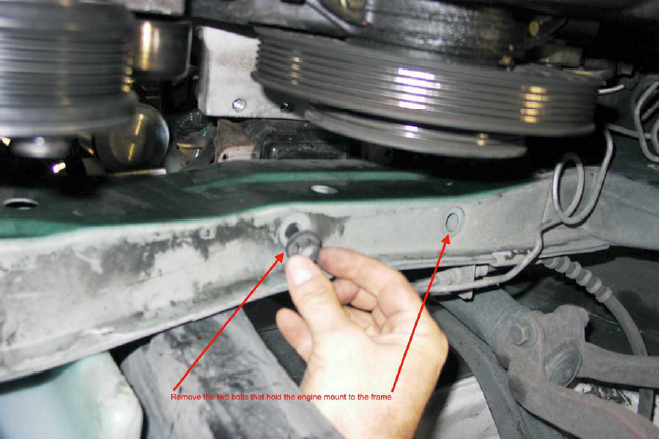 The pin is removed after you have preloaded the pulley with the 3.3 ft-lbs of torque and tightened the bolt. 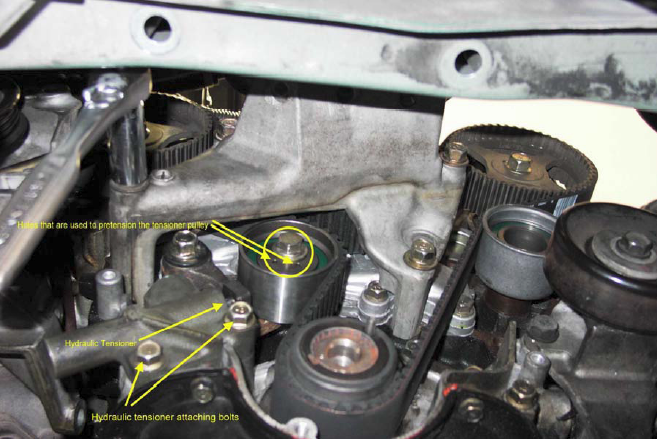 You know if you have correctly torque the tensioner pulley as you should be able to remove your “pin” without any excessive force, i.e., the forces are balanced between the tensioner and the pulley. To remove the old belt you can loosen the bolt on the tensioner pulley and then remove the bolts on the hydraulic tensioner. 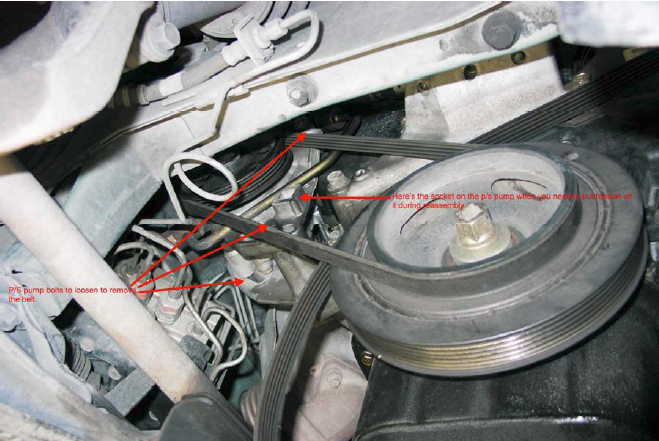 Installing the belt involves lining up all the timing marks and installing the belt over the pulleys in the order specified in the instructions. The instructions that came with the timing belt kit didn’t match up with the instructions in the shop manual. It appears either set of instructions should work. I used some plastic clips that I got at Harbor Freight to hold the belt on the pulleys while threading over the pulleys in the correct order, as specified by the instructions. 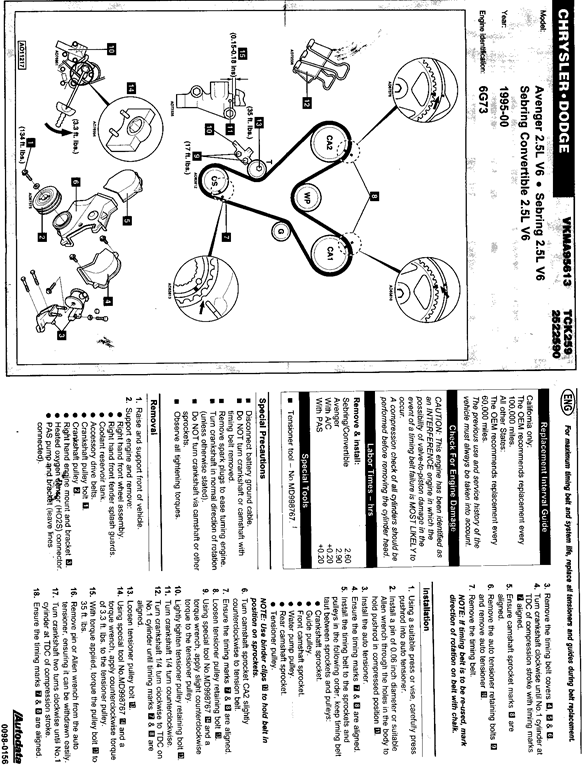 I’ve included a scan of the instructions that came with the timing belt kit I purchased at NAPA. 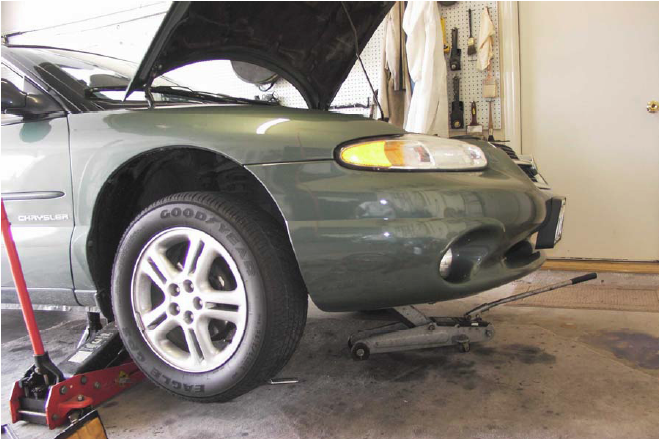 This entry was posted on January 24, 2012 at 2:00 pm	and is filed under Auto Repair. You can follow any responses to this entry through the RSS 2.0 feed. You can leave a response, or trackback from your own site. In your 8th picture, you list that you must take out 4 bolts on the engine mount but I can only find 3 and when I got them out, the mount is still secure and I cannot find anymore bolts to take out. Any ideas on where the other bolt is? The 9th photo shows the two engine mount bolts on the bottom. Great thank you I am on my way to replace my water pump. Will keep you posted.